According to emails among Gilbert staffers, [developer David] Sellers and financial consultants from April to June, the Brewers are willing to put $20 million toward the construction of the new facility. LGE Design Build also proposed a 13-acre village next to the facility that would include 220 hotel rooms, 85,000 square feet of office space and 50,000 square feet of retail. It would cost an estimated $70 million to build, although it’s unclear who would front that cost. We’ve been over the dismal economics of spring-training facilities before, so how do Gilbert officials justify this rather whopping expense? First by dodgy math — Sellers said annual tax receipts from baseball would only be $880,000, but there would also be added money spent at local restaurants and hotels (people are really going to stay at hotels in Gilbert rather than drive there from a more happening place? ), writing that “the Brewers coming into Gilbert is Gilbert tapping into a $850 million … Valley economic impact. Just 10 percent of that would be $85 million being spent in Gilbert that isn’t happening right now.” If the Brewers played, say, 15 home spring-training games at a 7,500-seat ballpark, that would only require each and every fan to spend $755 per game to make those numbers work out. Only one thing left to do: Find some different economists who’ll provide a different answer! Kathy Tilque, president and CEO of the Gilbert Chamber of Commerce, said the Applied Economics study was fairly limited in its scope and did not take into account the indirect economic benefits of a potential stadium. The chamber is working with a different economic consulting firm to provide a broader economic analysis. That report should be completed soon and will be turned over to town officials for review, Tilque said. “It would be a great thing not only for the East Valley but for Gilbert. We just need to make sure the numbers work,” she said. Surely she meant “check that the numbers work,” not “make sure that the numbers work, by cooking them,” right? Right? Sigh. My apologies to Mayor Daniels, the people of Gilbert, and anyone else who may have been unfairly depicted by my original report. Not the Gilbert Chamber of Commerce, though, because those guys are apparently weasels. The 121 sports facilities in use during 2010 cost taxpayers about $10 billion more than is commonly reported, thanks to hidden subsidies for things like land, infrastructure, operations, and lost property taxes. 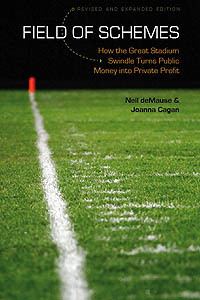 Once hidden costs are taken into account, the average sports facility split is 78% public, 22% private. The worst deals for the public include stadiums for the Indianapolis Colts, Cincinnati Bengals, and Milwaukee Brewers, each of which managed to rack up more in subsidies than the stadiums themselves cost to build. Best deals include venues for the Columbus Crew, Toronto Maple Leafs, and Ottawa Senators. Arenas are generally better deals than stadiums, because they cost less to build. And small cities tend to get get worse deals than larger ones, since they have less leverage to keep a team in town without large payoffs. If you’re not familiar with Long, she’s been a favorite reference of FoS ever since she first started publishing her “Full Count” data on the true costs of sports facilities close to a decade ago. (At one point her book was also going to be called “Full Count,” I believe, but it ended up with the slightly less pithy title “Public/Private Partnerships for Major League Sports Facilities.”) Until Long came along, for example, it wasn’t clear that the Minneapolis Metrodome was actually one of the best deals for the public, thanks to a lease that forced the teams to actually share revenues; you can read more about her work in a profile I wrote of her for Baseball Prospectus back in 2005. Needless to say, I’ll have much more to say about this once I’ve actually gotten my hands on a copy. (Which will have to wait until Routledge starts sending out either review copies or e-books, because $125 isn’t in my research budget.) But suffice to say that this is big, big news, and will be a huge boon to anyone trying to suss out the true public costs of stadium and arena deals after all the parts have stopped moving.